Since 1990 we have sold thousands of homes and saved sellers millions of dollars!! At 3% Real Estate we sell homes for a 3% fee and we sell lots of homes. Of course our concept goes against convention and agents will certainly say unkind things about our company, but that has only added to our success! Agents do not have an influence over the market - only buyers and sellers have that priviledge and with the MLS, sign and graphic in the yard, open houses, our international reach, and our truly professional agents we will sell your home, and we will save you money! Depending on the value of you home, enough money to send your child to college for a semester, maybe a year or two, or take that vacation. 3% was founded in 1990 and since that time has sold thousands of homes and saved Sellers millions of dollars and we do it in the shortest amount of time. We are full-service and service directed. You owe it to yourself to save money on the sale of your home. Why would you pay 6% or more when you don't have to? 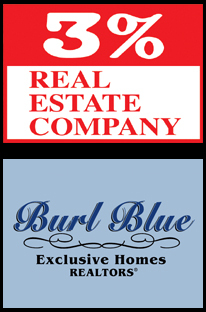 Call 3% Real Estate and let us show you the difference and how it can save you $1000's. 6% is a lot more than 6%, and here is how! If you have a home that is valued at $600,000.00 and you owe $400,000.00 and you pay a 6% commission when you sell your home, you have paid much more than 6%. You are actually paying 18% of your equity to sell your home! Maybe you should call your lender and have them pay 6% on their share. Don't pay 6%, pay less! Call 3% Real Estate Company! We sell homes for less and we are full-service. There are two things that determine how quickly your home will sell - PRICE & CONDITION. There are two ways to market your home and these two ways account for over 99% of all sales. They are the MLS and sign in the yard. We have signs and we belong to the REALTOR Board (MLS) so why would you pay more, when you don't have to.